JCW Absorbent Sound Screen | Sound Screens For Industrial & Commercial. 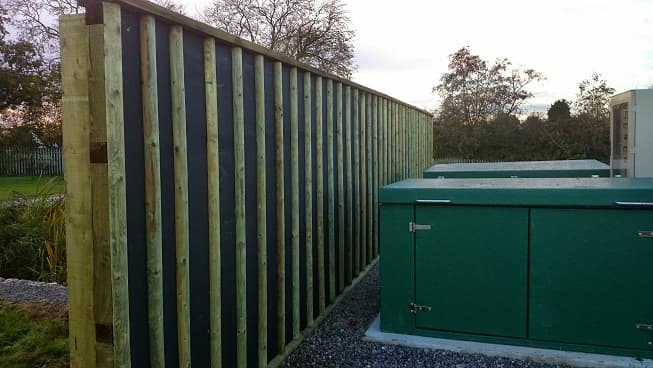 Built to Highways Standards and fitted into timber or steel posts, these screens are highly effective sound screens for industrial and commercial enclosures. Design and height to suit specific requirements. Maximum height 5 metres. The JCW Absorbent Sound Screen conforms and tested to BS EN 1793. Also tested and complies to BS EN 1794-1 and BS EN 1794-2. Structural calculations may be required by qualified persons, no responsibility can be accepted by using this design without professional advice. Height of JCW Absorbent Sound Screen is variable to suit specific locations. Post centres at 3.0m unless otherwise specified. Residential, Commercial, Industrial, Sports venues, Animal shelters, Dog kennels, Schools & Academies, Public Houses, Construction sites.